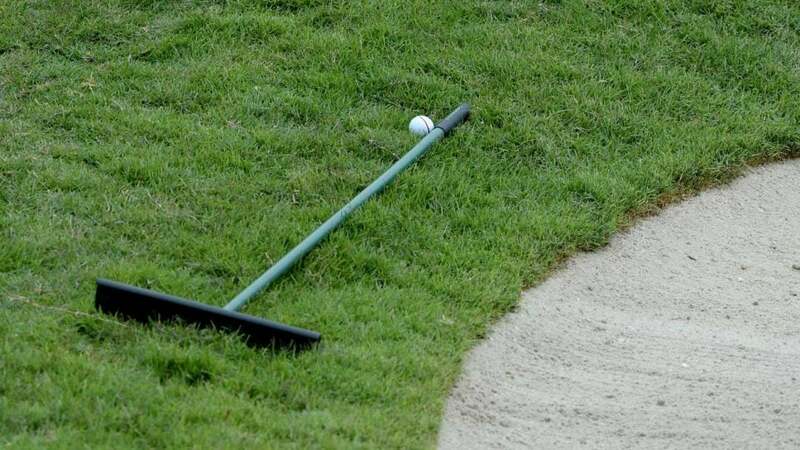 The Etiquetteist: Where exactly should you place a bunker rake? In the bunker or out? Front of the bunker or back? These are the important questions. Perhaps more than any other sport golf is mired with etiquette quandaries, from where to walk, to when to pay off a bet, to how to mark your ball. But fear not! Our resident Etiquetteist is here to help you negotiate tricky dilemmas at the club and on the course. (Looking for swing tips? Sorry, bud, you’re on your own there.) This week, our Etiquetteist tackles bunker rake placement. You can spend your whole life trying to avoid them, but at some point, you’re going to find a bunker, at which point you’re going to face the question: Where are you supposed to leave the rake? Some clubs print instructions on the rake handle, which makes it simple; proper etiquette calls for you to follow local rules. But otherwise, you’re left to your own devices. Inside the hazard? Just outside it? A hybrid position along the edge? On a quest for clarity, we turned to renowned sand-master Gary Player, who began his answer with a Player-esque walk down memory lane. “In my early days in golf,” the Black Knight began, “we had no bunker rakes at all! We just used our shoes to tidy up. It was quite common for your ball to roll into a footprint.” On the upside, Player said, it taught him to hit a wide variety of shots. After winning the British Open in 1959, Player returned to his home club and asked the military brigadier in charge of maintenance if they could get some bunker rakes. “He kicked me out of his office and called me an insolent SOB,” Player said. But we digress. THE ETIQUETTEIST: IS IT POOR FORM TO WALK ACROSS A GREEN WITH A GOLF BAG? On the matter at hand, Player says it’s best to leave the rake outside the bunker, “where it is least likely to interfere with play.” We agree. Though we understand the argument for inside-the-bunker placement (it prevents a rake from obstructing a bunker-bound ball, while also making it easier on maintenance to mow around the edges), we believe in striving for the lesser of two evils: better to inconvenience golf course-groomers than to inconvenience other golfers. To triple-check on this, we checked in with John Wood, PGA Tour caddie and longtime bagman for Matt Kuchar. “Always outside,” Wood concurred. Seasoned looper that he is, Wood got more specific: not only outside, but outside and past the bunker, as far as possible from the fairway (and for greenside bunkers, as far as possible from the green) with the handle parallel to incoming shots to further minimize the risk of interference. So, got that, folks? Unless local rules state otherwise, leave the rake outside the bunker. Which, for the record, is also where you should strive to leave your ball. Rules Guy: Can my playing partner block the sun for me if I’m blinded on the green?